Thanks for visiting my humble blog home! If you enjoy your visit, maybe you'd like to subscribe to my beauty blather through e-mail or Google Friend Connect (in the right column, below)? Feel free to visit me on Twitter, too. See you 'round the beautyverse! I admit it: I threw this product into my shopping bag partly out of curiosity and partly to get to the free shipping limit. Fortunately, I'm unexpectedly in love with the bright color and fruity taste of this lip tint, and I wish Missha would release half a dozen more shades! 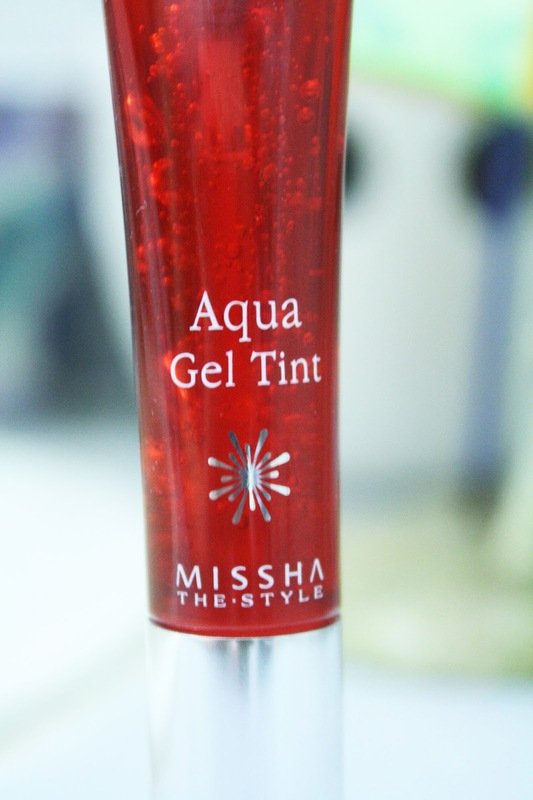 The Missha US web site says: "MISSHA The Style Aqua Gel Tint has strengthening moisture-maintaining power to prevent lips from dehydrating. It contains natural colorants to create pure and clear color. With certified organic ingredients and a fruity flavor, it gives you delicious vital lips." The moisturizing claim isn't just hype: I normally have semi-dry lips, and my lips have a comfortable hint of moisture when I wear this lip tint. The taste is intensely fruity — I almost want to actually eat this stuff! And the color can be just as intense as the taste, if you choose. I own this in "scarlet orange," which is, as you might guess, a bright red with a hint of orange. The color is extremely buildable, so you can take it from a classic sheer tint (which on me is a bright, slightly pinkish red) to a super-intense, almost lipsticky, more orangey shade. The gel tint dries to a matte, relatively non-sticky, non-smudging finish. It does fade as it dries, though, so the final color isn't as crazy bright as it looks when first applied. 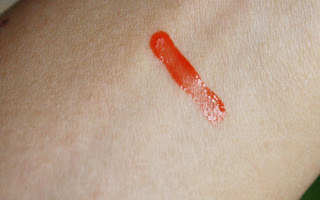 The applicator is pretty standard, and the tint goes on easily with a gel-like texture true to its name. The price seems reasonable for the amount you get (8.3g, or 0.29 fl oz). There's a little less in the tube than in most of my other lip glosses (which tend to be around 0.33 fl oz), but a little more than in my Josie Maran mini color stick (0.21 oz). Although I haven't found a complete ingredients list, this lip tint contains jojoba oil, buriti oil, and evening primrose oil, and colors derived from safflower seeds and gardenia seeds. It's also free of mineral oil, silicon, benzophenone, ethanol and animal ingredients. Wrist swatch: Missha The Style Aqua Gel Tint in Scarlet Orange. Photo taken outside, in the shade, on a bright afternoon. Your beautiful comments are always welcome! Header font: Kingthings Wrote by Kevin King. Ethereal theme. Powered by Blogger.